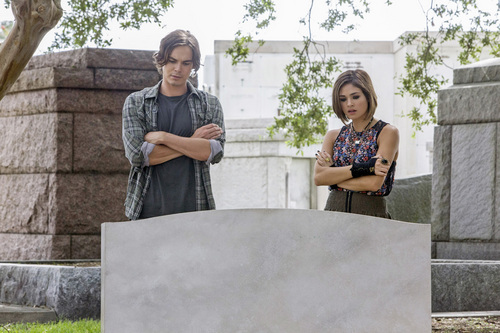 Courtesy photo Tyler Blackburn and Nicole Gale Anderson star in "Ravenswood" on the ABC Family Channel. If you&apos;re a fan of gorgeous young actors and things that go bump in the night, Ravenswood just might be the show for you.This new series, which premieres Tuesday at 9 and 10 p.m. on ABC Family, is a spinoff of "Pretty Little Liars." Although if you&apos;ve never seen that series, you won&apos;t be much more lost than anybody else. (There&apos;s some exposition at the top of the hour that sets up the premise. )The show revolves around Miranda (Nicole Gale Anderson) and Caleb (Tyler Blackburn), who are on their way to Ravenswood, Pa. She&apos;s going to look for long-lost relatives; he&apos;s going at the behest of his girlfriend, Hanna, who&apos;s still back on "Pretty Little Liars. "I don&apos;t want to give away too much. Actually, I can&apos;t give away a whole lot because it&apos;s rather confusing.And "Ravenswood" is REALLY cheesy. We get lines of dialogue like these:"There&apos;s so much death," Caleb says. "It&apos;s like the town&apos;s soaked in it. "And, when her mortician uncle isn&apos;t exactly happy to see her, Miranda exclaims, "What do I have to do to get his attention? Crawl in one of those boxes? "The young actors were clearly cast because of their looks, not because of their talent. But even the greatest actors on the planet couldn&apos;t make "Ravenswood" seem less, well, cheesy than it is.And that should probably sound less harsh than it does. "Ravenswood" appears to be pretty successful at doing exactly what it sets out to do - create a really pretty, gothic horror story. It&apos;s not great art, but it&apos;s supposed to be fun.If you like this kind of thing, it shows signs of being just that.